Pullbox Reviews: The Dresden Files – Wild Card #1 Who do you call? Jim Butcher’s worldwide bestselling Dresden Files saga continues in this original limited series! Set in the aftermath of the novel White Night and comic series Down Town, a bizarre double murder draws the interest of Chicago’s only wizard for hire. But as Harry Dresden begins his investigation, the clues lead to troubling conclusions about the possible perpetrator, and set him on a path that will place him in the middle of a conflict between the city’s three most powerful factions-a conflict that could engulf all of Chicago! This story, like most detective stories, starts out with murder. Two of them, both young women healthy and whole, with no sign of a cause of death. According to Medical Examiner Waldo Butters, there isn’t a single reason that either woman shouldn’t be up and walking around instead of laid out in his exam room. To help him figure out the cause behind the effect, Butters calls on Detective Sgt. Karin Murphy, and private investigator Harry Blackstone Copperfield Dresden. The first is a dedicated cop who’s become all too aware of the supernatural world around her and the chaos it brings, the second is the only openly practicing wizard of the White Council listed in the phone book (he doesn’t do birthday parties, and don’t even ask for love potions). Having an affinity for reading the lingering emotions and impressions left behind on the recently deceased, Harry’s apprentice Molly Carpenter is called on to take a look at the two bodies. What she finds is a surprising and total lack of anything. Where there is generally some trace of person’s last moments, Molly determines that whatever it was that killed the girls drained them of every last bit of everything that made them who they were. Their spirit, their life energy, completely wiped away and leaving behind empty husks that used to be living breathing people. Knowing with they know, Harry and friends compile a pretty short list of supernatural entities able to feed off of life energy. First on the list is a member of the White Court of vampires, able to incite and amplify emotions to tap into that well of energy to satisfy their hunger. While the White Court may be the least monstrous of the vampire community, their methods are easily more subtle and insidious because of their ability to slip unnoticed through their human herd. What isn’t known to many is that Thomas Raith, member of the leading house of the White Court, is Harry’s brother (long story… read the books). Understanding that the two deaths don’t quite fit into the more manipulative modus operandi of the White Court, Harry’s short on options and needs to start somewhere. Convincing Thomas to get him an audience with his sister Lara Raith is step one. Step two is actually getting a meeting with Lara. Step three is surviving said meeting to utilize any information Harry might gain. Never one to shy away from tough choices when the supernatural threatens the mundane, Harry dives into the case headfirst, pretty much defining “leaping before you look”. Just a heads up, I almost feel like this review is cheating… I’m a huge fan of Butcher’s Dresden Files book series. I didn’t even really hate the very short-lived television series on SyFy. It only stands to reason that I’m going to be onboard with more stories from this Urban Fantasy series, in any shape or form I can get them in. There have been several original Dresden stories given over to comic books, and that’s a great thing… Butcher’s style of writing lends itself very well to the visual medium. By his own admission, his personal image of Harry Dresden is something more closely resembling Peter Parker (only taller) than Gandalf the Gray. Not to say that this book is without its flaws, but for the most part those flaws are only going to be noticeable to the more attentive fans of Jim Butcher’s work. It’s just little things in the dialogue that don’t seem to quite fit the established characters, but nothing that detracts from story in any way… just nitpicking. Another hitch is in Harry’s character design. He’s too clean cut, not at all the constantly disheveled, unshaven mess that’s described in the novels and that I see in my head. Again, nitpicking. The art really is top notch, dynamic and clear, each character given their own distinctive look and style. If the only problem I have with Carlos Gomez’s work is that his character doesn’t look scruffy enough, I think that’s more my problem than his. 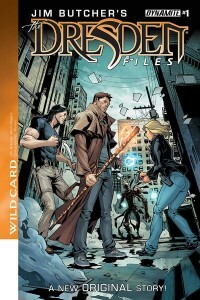 So far, every Dresden Files story arc that Dynamite has put out has been great. While Jim Butcher is no George R. R. Martin, it’s generally about two years in between novels. Having these comic mini-arcs interspersed throughout the continuity is a great filler. If you’ve never read any of the Dresden Files novels, you’ll never notice any of the very minor issues I’ve mentioned (you’re also missing out on some outstanding urban fantasy detective noir, but I won’t judge…). If you’re already a fan of Harry and his ragtag band of hooligans and ne’er-do-wells, this latest offering from the folks at Dynamite could very well be a great way to pass the time while you wait for the next book.